A fun an easy way to support the Ronald McDonald House. Project L.O.V.E (Lots Of Varying Essential) makes it easy for community members to collect goods the House and families need. Contact the Community Relations Manager for a Project L.O.V.E. Box and to find out what the House needs. Determine a location for your box and make sure to get permission if it is a business or organization. 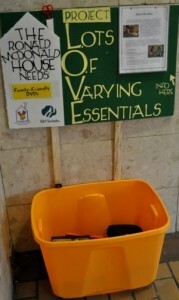 After 30 days or if the box is full return box and the donated items to the Ronald McDonald House. We Wish to thank the following for collecting items off the List or hosting a Project L.O.V.E. Jordan’s Floral and Gifts, Inc.